Welcome to Card of the Week! The purpose of this series is to prompt strategy discussion and answer any rules questions about specific cards. Feel free to share stories of how you’ve used the featured card in the past, speculations of how you might use it in the future, and any strong synergies or counters you may think of. And feel free to message me with any card requests for next week! Otherwise cards will be chosen randomly. Early on in the game when you don’t have much gold, Hooded Executioner isn’t anything special - just a 3/3 for 2g. Late in the game though, he punishes opponents hard for investing in single large units. He can even take out Tech III units! This is one of the few Tech I cards that you are happy to play in the late game. Sacrifice the Weak, Deteriorate - use these to clear out any other units hanging around so you can hit the one you want. Murkwood Allies, Bird’s Nest, Hive - things that generates extra tokens will make it hard for you to snipe key targets. Hooded Execution will follow his orders. Make sure you’re the one giving them! I love the flavor on this card, but as a general rule Bone Collector is often better than Hooded Executioner, mostly due to token spam techniques. If you can keep the opponent low on units though, great supplement/replacement to sacrifice the weak. This is much easier to use than sac the weak, especially in a multicolor deck, and still puts a 3/3 body for 2g on the board even when not boosted. I’m pretty sure b) is incorrect. According the the online rulings document, this skips over indestructible units. Even if you’re playing RAW ignoring online rulings, this would only sideline and exhaust indestructible units - it can’t destroy them. Death Rites, Hooded Executioner, and Obliterate don’t hit immortal at all. Doesn’t the post you’ve quoted agree with what I wrote, i.e. Hooded Executioner’s boost can’t affect indestructible units? A boosted Hooded Executioner will not have any effect on Indestructible units. what i meant in the 1st post was that HE boost can bypass an immortal killing an high tech unit. Bone Collector only contributes to the token spam plan if you get to attack with him, though. That’s roughly 50% of the time (going first), not what I would consider “often”. 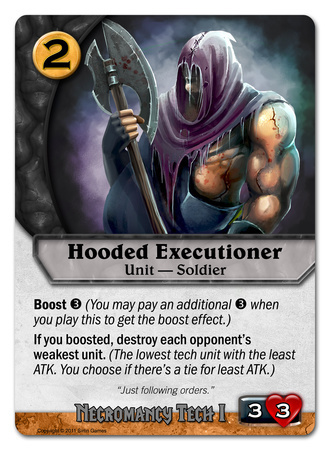 In situations where you don’t get to attack (either because going second or the opponent sets up well for Bone Collectors), Hooded Executioner is strictly better. 2g for 3/3 either way. One has extra value if it stays on the board, and the other only has extra value if you spend 3g more. I’d say you will make use of those extra values more in some matchups than others, and I think many matchups will favor the bone collector. That said, Executioner is a soldier, so if you have the purple starter, you could get some really good value out of hooded executioner with battle suits. This is only partially true. Bone collector is a significant ongoing threat, where as HE’s upside comes on cast (if you boost him). You can often force an opponent into an unfavorable trade while you’re defending, because the risk of a BC attacking is significant. Hey, peeps. We know about Bone Collector, this is not the “Bone Collector is better than Hooded Executioner” thread, it is “Check out this card and what it can do”. I like grabbing exactly one hooded executioner on turn 3 or 4, when it’s unclear if I will have my Tech 2 built/surviving. In case it wasn’t obvious, this card is exactly awesome in FFA… except for the “black is the biggest threat” problem. When every hand has a sac the weak or hooded exec, its good days. Probably helps purple in the long run though.